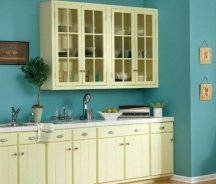 Interior Paint Finishes: What Sheen Is Best? 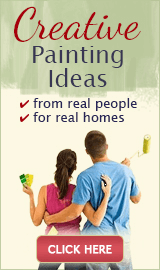 Many people don't know that not all interior paint finishes are meant to be used on the walls. But the sheen of paint makes a big difference, and no matter how much time you spend picking just the right paint colors, choose a wrong finish and you may ruin the whole look, or have to repaint sooner than necessary. 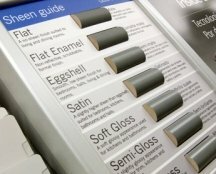 Flat, matte, eggshell, silk, satin, low-luster, semi-gloss, gloss, high gloss... and this list of finish names is not even complete! 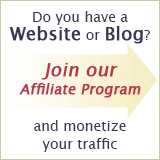 These names differ not only between manufacturers, but even between different product lines from the same manufacturer. And to add to the confusion even more, the paint sheen level can also be unpredictable. For example, you can buy 2 cans of satin paint (from different lines of the same brand, or from different makers), and they may look different - one may be shinier than the other. All interior paint finishes can be categorized into just 4 categories - ranging from dull to shiny. 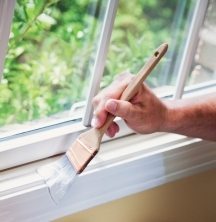 The first 2 are best used for walls and ceilings, while the last 2 are recommended for trim, doors and windows. 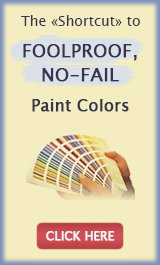 All paint manufacturers offer flat finish paints. Flat paints produce a dull, even velvety finish that looks best on foyer, living room, adult bedroom, home office and formal dining room walls. This interior paint finish is the easiest to touch up, it adds richness to the paint color and even hides minor surface imperfections. Besides, only flat paint should ever be used for painting ceilings if you don't want to see any glares or blotches around the light fixture. The only drawback to this rich paint finish is that its porous surface absorbs all stains like a sponge and can't be washed. The solution is to use a washable matte paint (also known as flat enamel) in the areas where you want the flat look (albeit no longer velvety) but may need to occasionally wipe down the walls. The next level of sheen that interior paints come in is eggshell, satin, silk and low-luster. Because it is less porous than flat paint, it's a practical choice for kitchens and bathrooms - it doesn't get soiled as fast and can be wiped down if needed. This finish is not flat, but not shiny either - it has a graceful, understated glow about it that also looks appropriate in family rooms, kids' bedrooms and hallways. Low sheen paints are beautiful and pretty low maintenance, but may highlight some surface flaws and even show roller marks if used for painting large walls, such as foyer walls. Semi-gloss, soft-gloss and medium gloss interior paint finishes are very durable and easy to clean. This fact seems so irresistible to some homeowners, that they decide to paint not only their kitchen, bathroom and hallway, but even the living room and bedroom walls in this finish - a very bad idea! 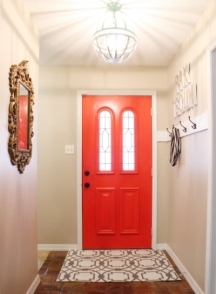 Medium sheen paints are meant to be used only for painting doors, windows and trim in your home. And unless your walls are made of paneling or wainscoting, don't be tempted to roll on this finish because it will just look cheap and plasticky, and showcase every single dent, bump, and brush and roller mark. If you must, you may get away with using this finish on the walls if they are broken up into small sections by doors, windows, tile or cabinets (when the wall area is so small, you can use a 4 1/2" foam roller to apply the paint with fewer marks). 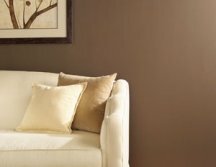 But even if the room is often humid and prone to mildew growth, or gets messy from fingerprints or splashes, it's still best to use a paint finish specifically designed for such areas - a washable wall paint in a matte or satin sheen (it will perform just as well but look much better). The last category of interior paint finishes includes gloss, high gloss and extra gloss paints. These hard-finish, smooth, non-porous enamels are the best choice for radiators and doors, windows and trim that get a lot of wear and tear (such as front and back doors, frequently opened windows, corner woodwork, furniture, etc). Household stains and dirt don't seem to stick to this glossy finish much and glide right off during cleaning, making maintenance a breeze. This paint finish is very shiny and just like medium-sheen paint, it should never be used for painting walls or ceilings - if a tasteful, beautiful home is what you want.